I was watching a documentary about Columbus recently that contained the following story, which I thought was pretty fascinating and that more people should know about it. Google searching for more information on the subject, it appeared that history itself does not care enough about it, not even enough to have a single article online telling the complete version of this story. In the modern age of Twitter and Wikipedia, we are all historians and journalists, so I decided to do it myself. When Christopher Columbus set sail for India aboard the Santa Maria, flanked by the Nina and the Pinta, he did so under tremendous pressure. With neither valid maps charting the way nor even a record of any ship ever navigating his westward journey, the risks involved for the 90 men on the journey were great. Failure to reach land before supplies ran out would mean agonising death by starvation. Since Columbus did not know how long the journey would take, and the three ships could face weeks in the open water without any sight of land and without any certainty forthcoming about when they would reach their destination, it was obvious that the issue of motivating his men would become a factor at some point in the voyage. While Columbus would more than likely pay a heavy price if mutiny was to occur, the financiers of the voyage (Queen Isabella and King Ferdinand of Spain) would also lose their entire investment. And so it was announced before the voyage that to the man who first sighted land, there would be a Royal Reward of 10,000 silver coins, per year, for the rest of that man’s life. For many of the sailors on board, this was not so much like winning the lottery, but winning the lottery with the knowledge that even if they were to lose it all, they would be given the same amount to do it all again next year. The Royal Reward was ingenious: eventually the ships would sight land, and the reward meant that every man on board the ship would think that he should wait patiently and be the one to spot it. For the Spanish Monarchs, if the voyage was successful they were set to become the world’s richest family anyway, while if no land was spotted then all the sailors would be dead and there would be no one left for to owe 10,000 silver coins. The ships left westward, and anyone with elementary knowledge of game theory or even childrens games can imagine what transpired at first. A decent opening strategy to win the Reward would of course be to wait for your turn ‘on watch’ in the crow’s nest high up in the mast of the ship, and then yell “Land! Land!” as often as possible. When you are ‘on watch’, you can see farther than anyone else below, so you would see this as your opportunity to win the Reward, and thus inform the rest of the crew of anything that even reminds you of land. So over the weeks, this became the norm on board the Nina, the Pinta and the Santa Maria. Whenever a change of watch came, this would bring with it a new man eager to shout “Land! Land!” as often as possible. Eventually the contest settled down, as it is more than likely that overenthusiastic land-spotters were chastised by the sailors themselves, and sightings were only reported if the spotter genuinely believed he had seen land. The reason for this is because the ships had now gone nearly two months without reaching land, a time period longer than Columbus’s original calculation for the maximum length of time it would take them to reach India. Supplies were running low, and the faith of the crew in the voyage were being tested. An erroneous sighting of land would get hopes up too high, and morale was fragile enough to be at breaking point. The Royal Reward was not high on anyone’s priorities anymore, merely survival. At approximately 2am on October 12th 1492, Rodrigo de Triana, a lowly sailor assigned to the watch on the Pinta, after several hesitations, shouted “¡Tierra! ¡Tierra!” and woke up the crew of the ship. The furore also woke up the crew of the nearby Nina and Santa Maria. Land had been spotted, and within hours Europe would enjoy her first awkward moments with the Americans, whom she believed to be India. Rodrigo de Triana had just ended the long, tortuous quest for land, and it appeared he had also won himself the Royal Reward of 10,000 silver coins per annum for the rest of his life, which for a man like de Triana in his early twenties meant that the world had just opened up to him, with no limits in sight. All of the risks had been worth it. Within a few hours, news trickled over from ship to ship that de Triana had a challenger for the reward, a man who claimed to have spotted land before, the previous evening. This confused everyone, as surely if someone had seen land hours earlier, it would have been reported and preparations would have begun to visit this new land. 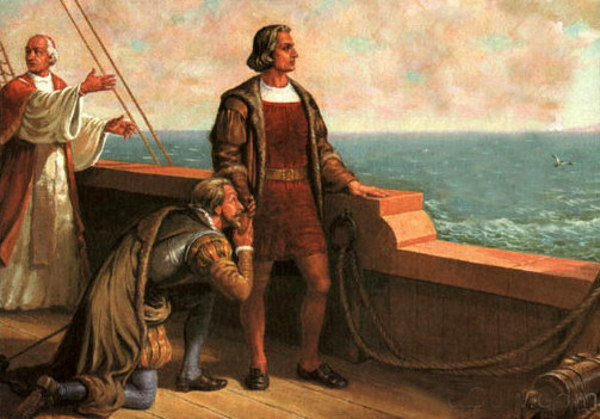 Eventually it was revealed that de Trianas challenger was none other than the leader of the voyage himself, Christopher Columbus. Columbus claimed that the previous evening, he was looking across the water and saw what appeared to him to be “a small wax candle that rose and lifted up”. He added that the event was so inconsequential that he did not feel the need to tell anyone about it. He noted all of that in his diary however, and used this as a basis to challenge Rodrigo de Triana’s claim to the Royal Reward once they returned to Spain. Columbus won, and along with the rewards of succeeding in his mission, he was awarded 10,000 silver coins for the rest of his life. De Triana never recovered from this event, forever cursing Columbus, and committing suicide in obscurity several years later, a broken man. Ok so obviously Christopher Columbus was not the worst person in history. He was not directly responsible for the deaths of millions of people, he never enlisted child soldiers and he never rode his Mongol hoards across the Eurasian landmass pillaging every village he could find. The reason I think this story is so fascinating is that even though Columbus could probably see how much the possibility of the Royal Reward meant to his men, and how it motivated them to pursue in their joint goal, he still saw it necessary to claim it for himself. Let us not forget that the Royal Reward was initially set up partially to offset the risk of mutiny, which was massively to Columbus’s vital benefit. What is worse is that he could easily have not drawn attention to his diary entry (if the story was true at all), and let de Triana win the reward, and thus be seen as an example to all sailors of how hard work and belief ultimately pays. Columbus came away from these voyages as a superstar, world famous, and obviously going down in history, yet the pettiness within him urged him to take even more. 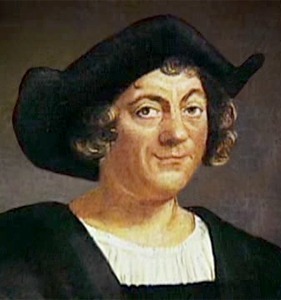 Maybe he was not a particularly bad man, but from this incident, I think it is difficult to come to any other conclusion but that Christopher Columbus, the man who discovered the New World, was a dickhead. I guess that makes two of you! What are your sources? How do you know Rodrigo killed himself? I’m doing something on him for school and would really like to know if he really killed himself but you cant really 100% trust blogs. 3. Columbus argued against it using his diary as evidence in court. It’s easy enough to find sources for all of thise things, everything else is filler. Good luck on your assignment.